Use the Coveside Conservation Products Eastern Bluebird House to give your bluebirds a suitable habitat. This house is especially designed for bluebirds that live in every state east of the Rocky Mountains. A slanting roof and inside drainage holes guard against rain, while the wooden entrance guard blocks predators from entering the house. Other features include proper design and dimensions for eastern bluebirds, ventilation that keeps the house from overheating and harming baby birds, and a rough interior that enables fledglings to climb out of the box. Lift the latched side panel for easy seasonal cleanouts. Mount this bird house to a post or hang it by the attached hook to entice beautiful, musical, scarce bluebirds to your yard. Handcrafted in the USA. 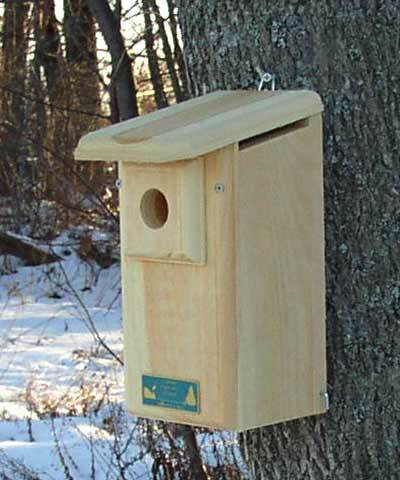 "Beautifully crafted white pine house, accurately-sized box and entry hole (with predator guard) for bluebird, bottom drainage on all four corners. Delivered in only 3 days (unheard at in our rural location). . . This would get a 5-star rating from me."